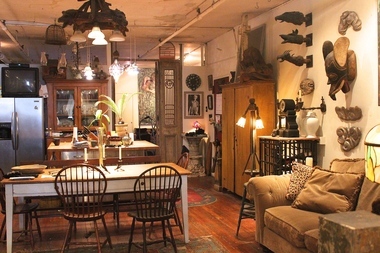 Inside the TriBeCa loft of artist Larry Camp, whose loft was became rent stabilized under the 1982 loft law, when most of the applicants were artists living in large spaces in Lower Manhattan. Under the amended Loft Law in 2010, most of the applicants live in Brooklyn buildings. Unlike the first wave of loft dwellers, the new ones tend to have more roommates to help cover the higher real estate costs. NEW YORK CITY — As state legislators hashed out new deals for rent-stabilization laws and 421a tax breaks for developers in recent weeks, they also re-opened the window for applications under the city's 2010 Loft Law — which had closed in March 2014 — and will keep it open for two years. That law allows tenants (and landlords) to apply to the New York City Loft Board to legalize their rentals even though they were not previously zoned as living spaces if at least three units were occupied by tenants for 12 consecutive months in 2008 and 2009 and the units remain occupied today. It's hard to know how many loft tenants who missed the initial round will now come forward and qualify under the law since these residents often try to live below the radar. But since the window closed more than a year ago, stories of loft tenants getting evicted became more popular, perhaps emboldening a new wave of applicants, several tenants and lawyers said. Advocates from the NYC Loft Tenants.org already know a "couple hundred" tenants ready to apply, organizer Heather Troy said. The group — whose volunteers have cased targeted neighborhoods looking for buildings with signs of habitation and knocking on doors to help tenants understand their rights — are hopeful many more will come forward. Based on conversations with tenants through the group's info-line, its housing clinics, results of a community survey and other outreach, the group estimates there are tens of thousands of qualifying units. Many of these tenants didn't apply before for a variety of reasons, advocates and lawyers said. Some didn't want to upset their relationship with their landlords. Some didn't realize they were living in illegal and potentially dangerous conditions not up to code. Some didn't know about the law or were unsure of engaging in a lengthy legal process. In early 2014, for instance, Troy's group found buildings in the South Bronx with hundreds of qualifying loft tenants. None of them had heard of the loft law, and to date, no tenant has applied for coverage from that area, the group noted. As the NYC Loft Tenant group's efforts got more attention right before the 2014 deadline, many residents scrambled to file before the deadline and many called the group's hotline after the deadline passed to ask how to apply, Troy noted. For the first four years that applications were open, there was an average of 91 applicants per year, according to an analysis of Department of Building data. Then in first 70 days of 2014, there was a spike of 113 applications. Advocates estimate that this covers as many as 1,288 "registered units" with the loft board. Real estate attorney Michael Kozek knows of one building in Bushwick and two in Williamsburg with potentially 60 to 70 units that intend to apply for coverage soon, but didn't previously either because they didn't realize there was a deadline or just couldn't get organized in time to meet it. Instead of waiting for tenants to organize, some landlords offered tenants buyouts to move or threatened them with eviction if they didn't take their security deposits and leave, Kozek said. Many advocates and lawyers know tenants who opted not to apply and then saw their rents skyrocket or were evicted as buildings were perhaps sold to developers. Tenant lawyer David Frazer got a call this week from a loft renter who didn't apply for coverage because he "was friends or thought he was friends with his landlord and didn't want to go against" him. That tenant was recently served eviction papers. Tenants can only apply for coverage if they are still occupying the unit — whether they were the ones occupying the unit in the 2008 – 2009 window or not, Frazer noted. If they weren't tenants 7 years ago, they still have the "burden of proof" to show that it was occupied and have to track down the people living there during that time, which can be a challeng, he said. "You can subpoena Con Ed or National Grid bills. For a number of cases, I've hired private investigators. I've managed to find people overseas. We've had loft board testimonies via Skype with people from as far as Vancouver," he said. "But it can be difficult to get [previous tenants'] cooperation." Still, Frazer called the re-opened application process significant. "There is a nontrivial number of buildings, which for whatever reason didn't apply," he said. "Most likely there are people who realized that not filing was a major mistake."